Thirsty Pilgrim: All Aboard the Lambic Bus. Think of it as a festival on wheels. HORAL – the High Council for Artisanal Lambics – has announced the bus itineraries for the Tour de Geuze on Sunday, April 26. 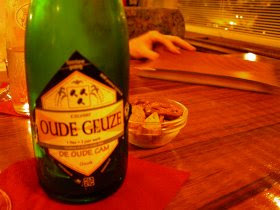 Basically the Tour is just a day when several Pajottenland lambic brewers and blenders open their doors to the public. You can drive yourself to them, or teleport, or arrive however you wish. But since beer is the focus it makes good sense to have others drive you around. (Attention: Drunken teleportation is incredibly dangerous.) Hence, the buses. Most of the buses depart around 10 a.m. from various train stations and parking lots. They each visit a unique sequence of lambic makers (make sure your favorites are on the list) and return to the starting point about seven hours later. Something else going on that weekend: The Vilvordia BierProefFestival on Saturday, April 25 in Jette, in northern Brussels. Interesting beer list here. In a near-future post I'll work out how to get there without a car and make it plain as day, thus saving your employer 15 minutes of precious productivity.